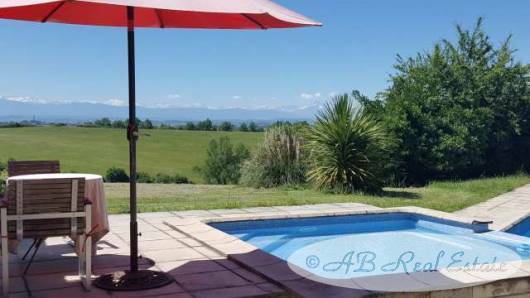 ***rare opportunity*** breathtaking views across the Pyrenees, authentic 19th C. farmhouse with luxurious outdoor dining, spacious swimming pool, professional stable with horse arena, hobby wine cave fully equipped with its own wine label, garage, various outbuildings, 30ha of continuous grounds with meadows, woods, small vineyard, 180 olive trees, fruit orchard, peaceful, short drive to amenities, easy access Toulouse airport, ideal for luxury private home or a farmer with horse breeding. Vineyard - It is today a pleasuring hobby still producing around 2000 to 3000 bottles a year. The grapes are Merlot, Sauvignon gris, Syrah et Cabernet Sauvignon; so red wine is produced. The wine cellar is very well equipped with 5 stainless steel tanks and all machines needed. All the winemaking equipment such as tractor, tipper, stalk separator, press, pump, filling machine etc is part of the sale. As mentioned before, the owner has elaborated a well balanced wine with a remarkable quality.